in Kailua-Kona on the Big Island of Hawaii. 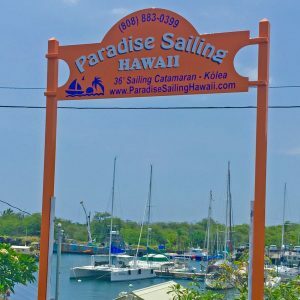 TIP #1 – If you have a smart phone, entering “Paradise Sailing Hawaii” in Google Maps will take you to the parking area for our boat. (Apple maps will occasionally take you to the wrong spot). TIP #2 – We just installed our new sign by the parking lot! It is the only ORANGE sign at the harbor. TIP #3 – Honokohau doesn't have any signs to tell you where the J dock is. Please follow the directions and map below and park across the street from the Hawaii Big Game Fishing Club. Take Hwy 19 south towards Kona. After passing Kona Airport, drive another 4.5 miles. Turn right onto Kealakehe Parkway. Follow the road STRAIGHT and stick to the left for approx. 0.6 miles. You will start seeing the Harbor on your right. Pass a restroom on your right (small building with RED roof), then pass the 'Hawaii Big Game Fishing Club' on your left (open building with a BLUE roof). Immediate after, turn right into the drive way and park your vehicle anywhere around here. Our dock starts at the end of the driveway. (If you reach gas station & fuel dock, you went a little too far.) Walk the dock all the way across the water then turn left. Our slip is the last one on your left, J-24. Take Hwy 19 north towards the Kona Airport. Drive approx.1.6 miles from Kailua-Kona. Turn left onto Kealakehe Parkway. Follow the road STRAIGHT and stick to the left for approx. 0.6 miles. You will start seeing the Harbor on your right. Pass a restroom on your right (small building with RED roof), then pass the 'Hawaii Big Game Fishing Club' on your left (open building with the BLUE roof). Immediate after, turn right into the drive way and park your vehicle anywhere around here. Our dock starts at the end of the driveway. (If you reach gas station & fuel dock, you went a little too far.) Walk the dock all the way across the water then turn left. Our slip is the last one on your left, J-24.